Frederick Phillips Brooks, Jr. (born April 18, 1931) is a computer architect, software engineer, and computer scientist, most famous for managing the development of IBM's System/360 Computer family hardware and then OS/360, then later writing candidly about the process in his seminal book The Mythical Man-Month. 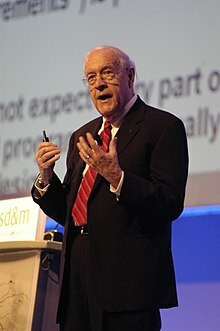 Brooks received a Turing Award in 1999 and many other awards. …well over half of the time you spend working on a project (on the order of 70 percent) is spent thinking, and no tool, no matter how advanced, can think for you. Consequently, even if a tool did everything except the thinking for you – if it wrote 100 percent of the code, wrote 100 percent of the documentation, did 100 percent of the testing, burned the CD-ROMs, put them in boxes, and mailed them to your customers – the best you could hope for would be a 30 percent improvement in productivity. In order to do better than that, you have to change the way you think. As quoted in Quoted Often, Followed Rarely, ; About the 1975 The Mythical Man-Month. "The IBM System/360 Revolution", recorded by the Computer History Museum, 7 April 2004 . Page 17, cf. Theodore von Kármán (1957): "Everyone knows it takes a woman nine months to have a baby. But you Americans think if you get nine women pregnant, you can have a baby in a month." Page 25 (italics in source, bold added). This second is the most dangerous system a man ever designs. When he does his third and later ones, his prior experiences will confirm each other as to the general characteristics of such systems, and their differences will identify those parts of his experience that are particular and not generalizable. The general tendency is to over-design the second system, using all the ideas and frills that were cautiously sidetracked on the first one. The result, as Ovid says, is a "big pile." An ancient adage warns, "Never go to sea with two chronometers; take one or three." Page 116 (italics in source). Page 153 (italics and ellipsis in source). Page numbers refer to Chapter 16 of The Mythical Man-Month, Anniversary Edition, cited above. Originally published in Information Processing 1986, the Proceedings of the IFIP Tenth World Computing Conference, H. K. Kugler, ed., Elsevier Science, 1986, pp. 1069–1076. Also reprinted in the IEEE magazine Computer, 20, 4 (April, 1987), pp. 43–57. Page 182 (italics in source).